Tendai (Japanese: 天台宗, Tendai-shū) is a Japanese school of Buddhism, a descendant of the Chinese Tiantai or Lotus Sutra school. The Tiantai teaching was first brought to Japan by the Chinese monk Jianshen (鑑眞 Jp: Gishin) in the middle of the 8th century, but it was not widely accepted. In 805, the Japanese monk Saichō (最澄; also called Dengyō Daishi 伝教大師) returned from China with new Tiantai texts and made the temple that he had built on Mt. Hiei (比叡山), Enryakuji (延暦寺), a center for the study and practice of what became Japanese Tendai. 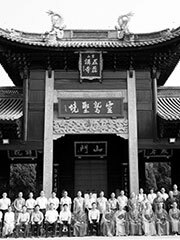 Philosophically, the Tendai school did not deviate substantially from the beliefs that had been created by the Tiantai school in China. However, what Saichō transmitted from China was not exclusively Tiantai, but also included Zen (禅, trad. 禪), esoteric Mikkyō (密教), and Vinaya School (戒律) elements. The tendency to include a range of teachings became more marked in the doctrines of Saichō’s successors, such as Ennin (圓仁) and Enchin (圓珍). The Tendai sect flourished under the patronage of the imperial family and nobility in Japan; in 784, the Imperial capital was moved fromNara to nearby Kyoto. Tendai Buddhism became the dominant form of main-stream Buddhism in Japan for many years, and gave rise to most of the developments in later Japanese Buddhism. Nichiren, Honen, Shinran, and Dogen—all famous thinkers in non-Tendai schools of Japanese Buddhism—were all initially trained as Tendai monks. Japanese Buddhism was dominated by the Tendai school to a much greater degree than Chinese Buddhism was by its forebearer, the Tiantai. Due to its patronage and growing popularity among the upper classes, the Tendai sect became not only respected, but also politically and even militarily powerful. The Tendai school used its patronage to try to oppose the growth of rival factions—partcularly the Nichiren school, which began to grow in power among the merchant middle class, and the Pure Land school, which eventually came to claim the loyalty of many of the poorer classes. Enryakuji, the temple complex on Mt. Hiei, became a sprawling center of power, attended not only by ascetic monks, but also by brigades of warrior monks (sohei) who fought in the temple’s interest. As a result, in 1571 Enryakuji was razed by Oda Nobunaga as part of his campaign to unify Japan. Nobunaga regarded the Mt. Hiei monks as a potential threat or rival, as they could employ religious claims to attempt to rally the populace to their side. The temple complex was later rebuilt, and continues to serve as the head temple of the Tendai school today. Tendai buddhism has several philosophical insights which allow for the reconciliation of Buddhist doctrine with aspects of Japanese culture such as Shinto and traditional aesthetics. It is rooted in the idea, fundamental to Mahayana Buddhism, that buddha-hood, the capability to attain enlightenment, is intrinsic in all things. Also central to Mahayana is the notion that the phenomenal world, the world of our experiences, fundamentally is an expression of the buddhist law (Dharma). This notion poses the problem of how we come to have many differentiated experiences. As opposed to Shingon buddhism, which holds we perceive the world(which truly is only one thing, Dharma) as many distinct phenomena because of seeds of ignorance stored within our consciousness that cause us to differentiate it, Tendai Buddhism claims that each and every sense phenomenon just is the expression of Dharma. For Tendai, the ultimate expression of Dharma is the Lotus Sutra. Therefore, the fleeting nature of all sense experiences consists in the Vairocana Buddha’s preaching of the doctrine of Lotus Sutra. The existence and experience of all unenlightened beings, from those condemned to hell to the Boddhisattva, is fundamentally equivalent and undistinguishable from the teachings of the Lotus Sutra. This philosophical insight taken from Chinese Tiantai Buddhism allowed for Japanese practitioners to adapt Tiantai doctrine to several outside influences, which created the uniquely Japanese variant of Tendai. The first of these adaptations was the introduction of Shingon esoteric ritual (mikkyou) into Tendai buddhism. Eventually, according to Tendai Taimitsu doctrine, the esoteric rituals came to be considered of equal importance with the exoteric teachings of the Lotus Sutra. Therefore, by chanting Mantras, maintaining Mudras, or performing certain meditations, one is able to see that the sense experiences are the teachings of Buddha, have faith that one is inherently an enlightened being, and one can attain enlightnenment within this very body. This is very different from other Buddhist schools, particularly of Theravada Buddhism, which maintain that it takes many lifetimes to attain enlightenment. Tendai doctrine allowed Japanese Buddhists to reconcile Buddhist teachings with the native religion of Japan, Shinto, and with traditional Japanese aesthetics. In the case of Shinto, the difficulty is the reconciliation of the heavenly pantheon of Japanese gods, as well as with the myriad spirits associated with places, shrines or objects, with the Buddhist doctrine that one should not concern oneself with any religious practice save the pursuit of enlightenment. However, priests of the Tendai sect argued that Kami are simply representations of the truth of universal buddha-hood that descend into the world to help and teach mankind. Thus, they are actually equivalent with Buddhas. This doctrine, however, regards Kami as more sacred. While Buddhas represent the possibility of attaining enlightentment through many lifetimes of work and devotion to Dharma, Kami are manifest representations of the universal buddha-hood. Therefore, they exemplify the ultimate truth that all things are inherently enlightened and that it is possible for a person of sufficient religious faculties to attain enlightenment instantly within this very body. Thus are they of more holy nature than buddhas. Those Kami that Shinto regards as violent or antagonistic to mankind are considered as simply supernatural beings that reject the Buddhist law and have not attained enlightenment. Thus are they violent and evil. The fundamental teaching of Buddhism is that one must shed away worldly attachments and desires in order to attain enlightenment. This created a conflict with the culture of every society into which Buddhism was introduced. If one is to shed worldly pleasures and attachments, this requires that such flowers of culture as poetry, literature, and visual arts be discarded. By claiming that the phenomenal world is not distinct from Dharma, Tendai doctrine allows for the reconciliation of beauty and aesthetics with Buddhist teachings. Poetry, which once was a sin to be cast away, now in fact can lead to enlightenment. Contemplation of poetry, provided that it is done in the context of tendai doctrine, is simply contemplation of Dharma. This same thing can be said of every other form of art. Therefore, it is possible to construct an aesthetic that is not in conflict with Buddhism.